"But He knows the way that I take; When He has tested me, I shall come forth as gold" (Job 23:10). "In this you greatly rejoice, though now for a little while, if need be, you have been grieved by various trials, that the genuineness of your faith, being much more precious than gold that perishes, though it is tested by fire, may be found to praise, honor, and glory at the revelation of Jesus Christ" (1 Peter 1:6-7). "My brethren, count it all joy when you fall into various trials, knowing that the testing of your faith produces patience. But let patience have its perfect work, that you may be perfect and complete, lacking nothing" (James 1:2-4). "And not only that, but we also glory in tribulations, knowing that tribulation produces perseverance; and perseverance, character; and character, hope" (Rom. 5:3-4). "Blessed be the God and Father of our Lord Jesus Christ, the Father of mercies and God of all comfort, who comforts us in all our tribulation, that we may be able to comfort those who are in any trouble, with the comfort with which we ourselves are comforted by God. For as the sufferings of Christ abound in us, so our consolation also abounds through Christ" (2 Cor. 1:3-5). "For indeed He does not give aid to angels, but He does give aid to the seed of Abraham. Therefore, in all things He had to be made like His brethren, that He might be a merciful and faithful High Priest in things pertaining to God, to make propitiation for the sins of the people. For in that He Himself has suffered, being tempted, He is able to aid those who are tempted" (Heb. 2:16-18). "Seeing then that we have a great High Priest who has passed through the heavens, Jesus the Son of God, let us hold fast our confession. For we do not have a High Priest who cannot sympathize with our weaknesses, but was in all points tempted as we are, yet without sin. Let us therefore come boldly to the throne of grace, that we may obtain mercy and find grace to help in time of need" (Heb 4:14-16). "And He said to me, “My grace is sufficient for you, for My strength is made perfect in weakness.” Therefore most gladly I will rather boast in my infirmities, that the power of Christ may rest upon me. Therefore I take pleasure in infirmities, in reproaches, in needs, in persecutions, in distresses, for Christ’s sake. For when I am weak, then I am strong" (2 Cor 12:9-10). "Who shall separate us from the love of Christ? Shall tribulation, or distress, or persecution, or famine, or nakedness, or peril, or sword? As it is written: “For Your sake we are killed all day long;We are accounted as sheep for the slaughter.” Yet in all these things we are more than conquerors through Him who loved us. 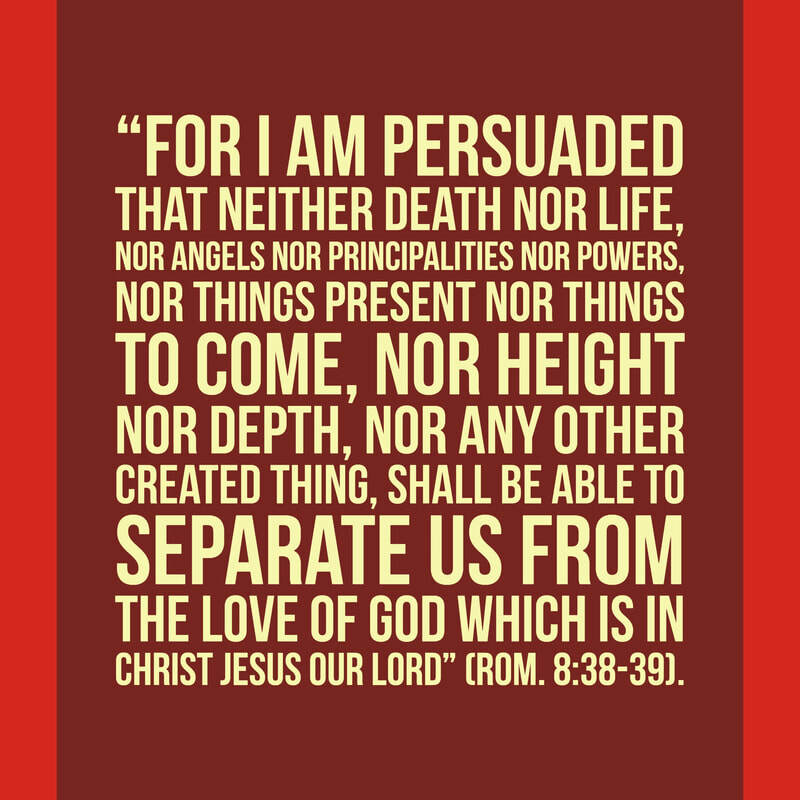 For I am persuaded that neither death nor life, nor angels nor principalities nor powers, nor things present nor things to come, nor height nor depth, nor any other created thing, shall be able to separate us from the love of God which is in Christ Jesus our Lord" (Rom. 8:35-39). "But may the God of all grace, who called us to His eternal glory by Christ Jesus, after you have suffered a while, perfect, establish, strengthen, and settle you. To Him be the glory and the dominion forever and ever. Amen" (1 Peter 5:10-11).